Baby potatoes are mostly loved by everyone. I too love baby potatoes in any form. One of my most favorite dish is Dum Aloo. 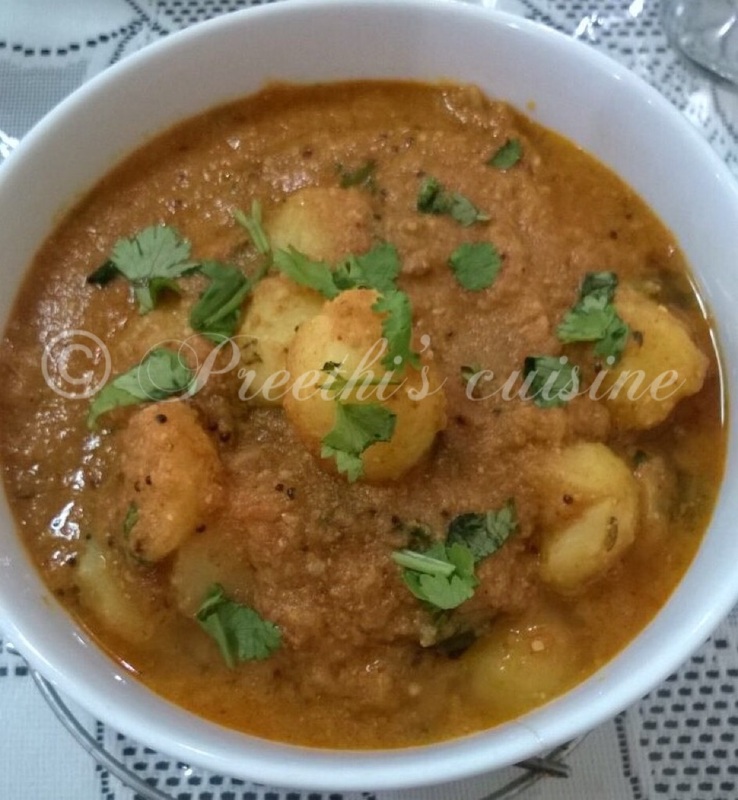 I have made some variations to the authentic Dum aloo and this recipe is a hit with my family. I had some friends for dinner and this was on my menu. They just loved this recipe. I am sure you will love this variation too. Boil the baby potatoes with salt. Peel and keep it aside. Make a puree of tomatoes, chilli and some fresh Corriander. Heat oil in the wok. Add grated ginger , all the dry masala and corriander. Roast for sometime but ensure it does not burn.Add the tomato chilli puree and salt to taste. Saute till oil starts leaving the sides.Lastly add the boiled potatoes and cook till the water in the gravy evaporates a little and the potatoes are coated well. Lastly once done garnish with corriander. Serve hot with rotis or poori. A delicious curry. Potatoes with a thick delicious gravy is always a hit at my home.